Mounting evidence reveals that nature and outdoor environments provide individuals with dementia greater enjoyment in life, lower stress levels, and positive changes to physical well-being. Outdoor Environments for People with Dementia explores how fulfilling the fundamental genetically based need of human relationships with nature can improve the health and well-being of people with dementia. Top experts analyze current research and comprehensively examine how the design processes of gardens and parks can be closely connected to effective interventions. Evaluation tools for those with dementia are discussed, including studies of the impact of plants and outdoor activities on this population. 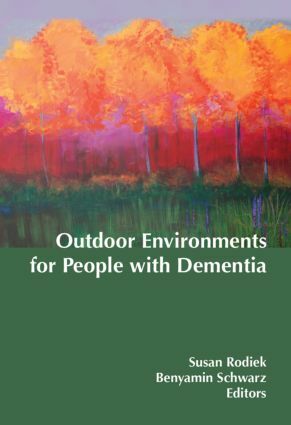 Outdoor Environments for People with Dementia discusses in detail practical approaches that can significantly improve the quality of life for dementia victims. Research is discussed revealing important aspects and issues needing to be addressed when creating better outdoor environments that are effective in helping residents of long term care facilities and residential care homes. The text is extensively referenced and provides several tables, figures, and photographs to clearly illustrate concepts. Outdoor Environments for People with Dementia is a valuable resource for scholars, policymakers, legislators, architects and urban planners, lending institutions, developers, landscape architects, and the lay public in general who have an interest in the subject—personal, professional, or civic.